this was an exercise. our knees almost gave up. either punish yourself by going this way or you can climb through a winding path in order to reach the top. we went through these "forever steps" when going up but took the long winding path on our way back. 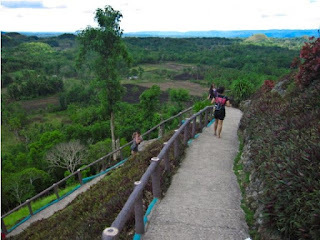 and after that sweating and knee-wobbling stunt, finally the view of the chocolate hills. our guide told us that we shouldn't expect the hills to be so "chocolaty" anymore since grasses already started to grow in these hills. best time to go here is during summer but then again, it was still chocolate-looking for me. reminded me of the ever famous peanut kisses. 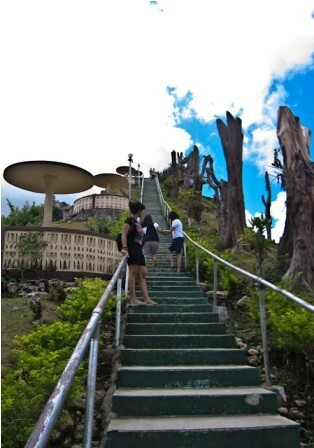 in order to have the best view of the chocolate hills, we ascended way up to this hill. i don't know if this is also one of the chocolate hills. it would be a tragic case, if it was so since it unfortunately suffers commercialism. lots of tourists were there, both local and foreign. 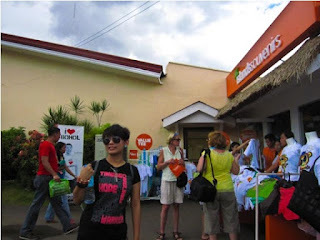 there's even island souvenirs, displaying their bohol shirts and other souvenirs. we were just dropped off at this point since cars are not allowed to park here. there is a designated parking area down the hill. it was already almost lunch when we were finished with our numerous photo sessions and narcissism with the chocolate hills. i suggested to my family that we wouldn't be having lunch in the floating restaurant in loboc because aside from it's really expensive (350Php/person - buffet lunch), the food is not worth the price (based on the blogs i had read). though, i think it would still be an experience, having lunch while cruising down the river but in order to keep up with our budget, we just had to let it go. so we told our driver that we would be having lunch just around loboc, hinting for an affordable place to eat. but before giving in to our hunger, we stopped by in this butterfly conservation center. i remembered reading one blog that there was really nothing interesting here. then, i knew why. 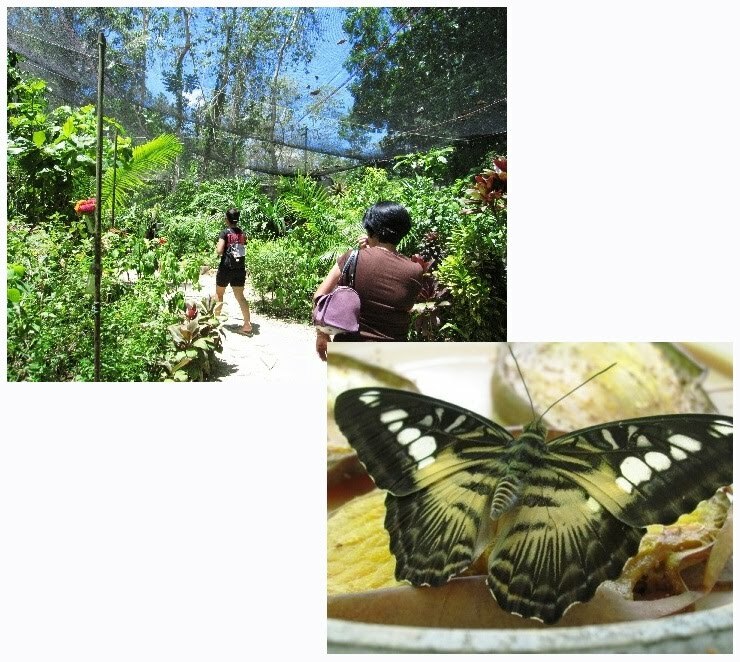 we had a guide who toured us around, explaining facts about butterflies we all know back in our elementary days. they didn't have that much butterflies and sadly, they were just the usual butterflies, i occasionally see back home. initial plan was, we would be having our lunch here since they have these posters that advertised their "lunch starting at 80Php" everywhere. a girl from there gave us the menus and we then chose our table but after a few minutes of browsing their menus and deciding on what to eat, the girl approached us and told us that they were having 18 guests who made reservations ahead and they couldn't accommodate us anymore. omg. they should have told us sooner before they even handed us the menus. boo! 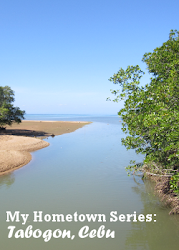 on our way to loboc, we decided to stop here in the man-made forest. it's a long stretch of mahogany trees and the road here is kinda dark since trees were towering and not that much sunlight can pass through. the forest reminded me of those thriller movies. again, we made another stop before lunch. this time in the hanging bridge. if you are used to extreme heights, you would find this boring but i am not used to extreme heights! anyway, it was not scary at all even if the bamboo splits, that we walked on were creaking. only one bridge was used to be here but the people probably decided that it's better to provide a separate exit bridge. 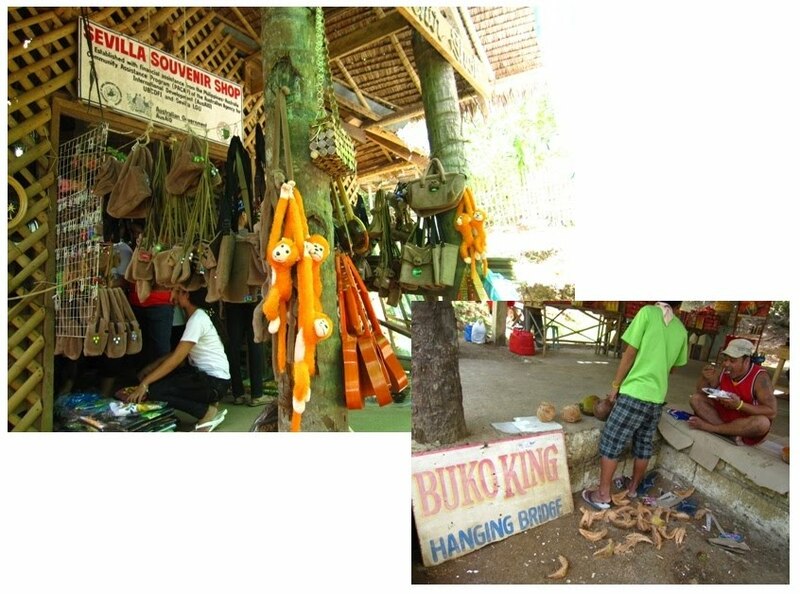 across the bridge, there are souvenir shops that sell a lot of tarsier stuff. our driver told us that "buko king" is stationed here. 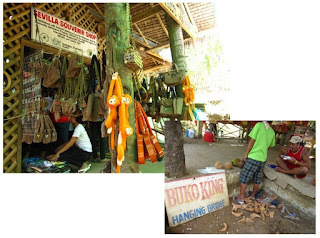 "buko king" is known for husking coconuts with his own teeth. to watch him in action, you buy a coconut for him to husk. finally, we had our lunch in loboc in some usual filipino eatery. there were also tourists from luzon, luzon because they were speaking in tagalog. haha! one of them inquired the specialty of the place and the presumed owner replied that it's carabao. yikes. so i ordered the food i was sure, wasn't carabao, like eggplant and vegetable soup. i didn't feel like eating unusual food at that time. it was really a cheap lunch, just around 500Php for the 6 of us, including our driver. next stop was the tarsier encounter in loboc. weeeee! tarsiers! it had been my weird dream to see an actual tarsier. i didn't get to see one the first time i went to bohol since me and my friends went directly to panglao and the tarsier probably was the main reason i insisted on the day tour even if my parents had done it years ago. No Entrance Fee. you only have to make a donation and with those eyes, you can't just help but donate. my parents didn't get to see prony during their first bohol day tour. their driver told them it was a bit far and the road was difficult, a typical dirt road. prony must be extremely famous since a lot of tourists were already there, when we arrived. people willingly lined up just to get a picture with prony. 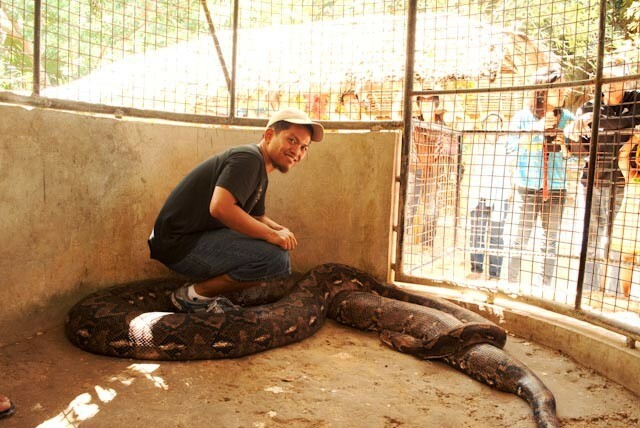 as stated in their posters, prony is said to be the biggest python in captivity (in the philippines?). the place is like a mini zoo since it also has other animals, mostly birds though. prony is fat and it eats an entire pig. @_@ since i don't have a thing for snakes, i didn't sit the way my brother sat in the picture. i was just beside prony, mustering a fake smile. one of the reminders that we were under once by the spanish regime. really old church. it was built almost of stones. i just couldn't imagine the manual labor. the baclayon church has a museum but we didn't go since we were not in our proper attire and they had a big board that told us so. my parents went to the museum but they didn't go around since they had once been there. we didn't get to see the inside of the church since entry was only through the museum at that time. lastly, the blood compact of legazpi and sikatuna as told in our history. the shrine is overlooking the sea. you can see pamilacan island in the distance and from what i had read in the internet, dolphin watching is around that island. i think this is not the exact spot where the blood compact happened. we passed by some place and written on a big board was a declaration that it was the actual place of the blood compact. anyway, only legazpi, sikatuna and the rest of the guys accurately knew. we were already tired in the blood compact shrine, considering we woke up early for our trip to tagbilaran. we were finally on our way to panglao when the driver suddenly remembered that we forgot to stop by at a big souvenir shop, "Approniana Souvenir Shop". it was a huge shop. 2 floors. accepts credit cards. when we got there, some guys handed us discount stubs for the shop. probably to entice us more to buy there. we bought delicacies because we might not have the luxury of time anymore. we had an innova as our service car. good for 5 persons. 2200Php excluding the entrance fees.